BLACKFIRE All-In-One All Purpose Cleaner 4 oz. The only APC you need for every auto surface! Think of all the materials that make up your vehicle: metal, plastics, rubber, vinyl, leather. Now think of all the different cleaners available for each surface. There are a lot, right? You could try them all or you could buy one bottle of BLACKFIRE APC All-Purpose Cleaner. It works on all those surfaces and you have the power to adjust the dilution ratio as needed. How can one cleaner work on greasy engine parts and on leather upholstery? BLACKFIRE APC All-Purpose Cleaner is made with advanced, proprietary cleaning technology that is safe on your vehicle's delicate surfaces and safe for the environment. Use BLACKFIRE APC All-Purpose Cleaner full strength as a bug and tar remover for paintwork, metal, and glass. Degrease the engine compartment and remove stubborn brake dust from wheels and wheel wells. 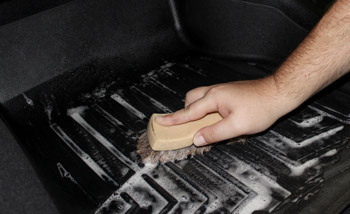 Dilute BLACKFIRE APC All-Purpose Cleaner 4:1 with water to clean the dashboard, door panels, and trim. Remove spots and spills from finished leather seats. Clean plastics and paint. BLACKFIRE APC All-Purpose Cleaner is excellent on boats and RVs, too. You'll find countless uses for detailing and general cleaning. 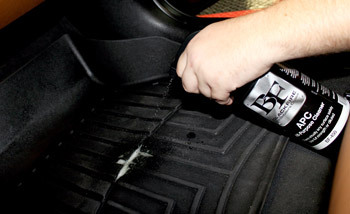 BLACKFIRE APC All-Purpose Cleaner has an unlimited amount of uses - tires, undercarriages, and in this case, your floor liners! BLACKFIRE APC All-Purpose Cleaner is an outstanding value for professional detailers and do-it-yourselfers. At a dilution ratio of 4:1, one 20 oz. bottle makes up to four bottles of APC! Use it full strength for tough cleaning jobs. BLACKFIRE APC All-Purpose Cleaner is the only cleaner you need, no matter what you're cleaning. Use full strength on wheels, tires, engine components, and exterior trim. Dilute 4:1 with water to safely clean leather, paint, fabric, carpet, plastics, and vinyl. Removes dirt, oil, grease, insects, tar, brake dust, food stains, and more. For tough cleaning jobs, spray full strength onto surface. Agitate with a brush or towel if needed. Rinse off. For interior surfaces, dilute 4:1 in a spray bottle. Spray on and wipe off. Test for colorfastness of carpet, upholstery, and leather in a small, inconspicuous area. Spray on and allow to dwell for 30 seconds. Agitate with a brush and pat dry with a towel. Bought this because I needed to remove dried on wax on plastic parts (mud flaps, door handles, etc.) because I'm just to lazy to detail my car carefully. Worked as advertised in removing dry wax.